I first got to know Human Heart Nature (or more commonly referred to as Human Nature) through an online forum about three years ago. I was immediately attracted by its wide array products, natural and organic at a very affordable price. I looked it up and Googled the nearest distributor in my area. I have then registered to be a dealer mainly because I wanted to have discounts for my personal purchases , you know how wais (smart) moms are. Among its line of make-up, baby care and skin care products, my favorite is the Citronella Bug Spray (now called Bug Shield Mosquito Repellent) . It is the one item that I always keep in handy wherever I go. See, I have a feeling that my skin is the type that mosquitos go for. Sounds like a compliment eh? But it's not. Ever since I was a kid, I can remember everytime that I am outside the house playing or simply hanging out with friends, I always noticed that I am the only one being bitten by these pesky insects. Does this mean that my blood is sweeter than theirs? They are sucker for my blood, literally. Back to my mosquito dilemma, I couldn't put to words my happiness that I've finally found the one product that I can bring anywhere to repel insects. What I love about this product are the natural ingredients making it safe to use even by babies and toddlers. I am also particularly glad that it DOESN'T contain DEET, a chemical used by conventional insect sprays and lotions which can cause to kill brain neurons and become hazardous to our body's nervous system. The new packaging of this best-seller citronella insect repellant now has an improved formulation-- an infusion of soy bean oil and eucalyptus oil for better protection, and leaving a better fragrance. It is priced reasonably at Php 99.75 for 50ml and Php 159.75 for 100ml bottles. This is very nice because it's natural! I need one of this as my daughter is allergic to mosquito bites. 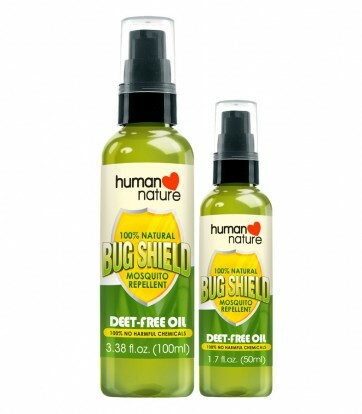 I frequently buy bug spray, especially DEET-free, for my daughter. It is nice to know that manufacturers nowadays produced organic and natural products. I have heard about Human <3 Nature a lot of times from friends. Unfortunately, I couldn't find one here. A must-try I should say! Seems a nice product to try, But I heard from some people that these moaquito repelleant have some side effects. What's the real score? this is a good product especially this rainy season. This could be handy for people with allergic reaction to mosquito bites. I remember when I had my vacation, seems like mosquitoes love my blood. If only I could have known this by the time.